A giant isopod is any of the almost 20 species of large isopods (crustaceans distantly related to shrimp and crabs, which are decapods) in the genus Bathynomus. They are abundant in the cold, deep waters of the Atlantic, Pacific and Indian Oceans. Bathynomus giganteus, the species upon which the generitype is based, is often considered the largest isopod in the world, though other comparably poorly known species of Bathynomus may reach a similar size (e.g., B. kensleyi). The giant isopods are noted for their resemblance to the much smaller common woodlouse (pill bug), to which they are related. French zoologist Alphonse Milne-Edwards was the first to describe the genus in 1879 after his colleague Alexander Agassiz collected a juvenile male B. giganteus from the Gulf of Mexico; this was an exciting discovery for both scientists and the public, as at the time the idea of a lifeless or "azoic" deep ocean had only recently been refuted by the work of Sir Charles Wyville Thomson and others. No females were recovered until 1891. Giant isopods are of little interest to most commercial fisheries, but are infamous for attacking and destroying fish caught in trawls, and they are eaten in Taiwan. Specimens caught in the Americas and Japan are sometimes seen in public aquariums. 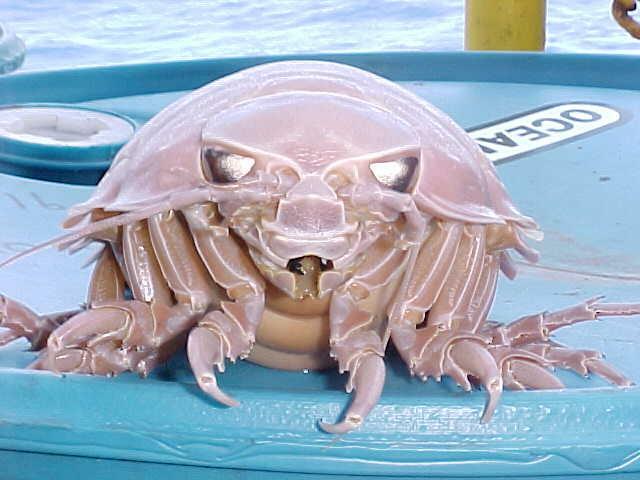 Giant isopods are a good example of deep-sea gigantism, as they are far larger than the "typical" isopods that are up to 5 centimetres (2.0 in). Bathynomus can be divided into "giant" species where the adults generally are between 8 and 15 centimetres (3.1 and 5.9 in) long and "supergiant" species where the adults generally are between 17 and 50 centimetres (6.7 and 19.7 in). One of the "supergiants", B. giganteus, reaches an average length between 19 and 36 centimetres (7.5 and 14.2 in), with a maximum weight and length of approximately 1.7 kilograms (3.7 lb) and 76 centimetres (30 in) respectively. A study of the seasonal abundance of B. giganteus juveniles and adults suggests a peak in reproductive capacity in the spring and winter months. This is observed to be due to a shortage of food during the summer. Mature females develop a brood pouch or marsupium when sexually active, the pouch being formed by overlapping oostegites or brood plates grown from the medial border of the pereiopods. The young isopods emerge from the marsupium as miniatures of the adults, known as mancae. This is not a larval stage: the mancae are fully developed, lacking only the last pair of pereiopods.